Chris and I started watching Season 2 of House of Cards last night, and there was one line of dialogue where a guy is talking about grief after losing his wife (not a spoiler, I promise). He says something along the lines of, "I mean, who dies of breast cancer at 31?" Chris and I both laughed awkwardly. It isn't funny. But it means that -- little by little -- word is getting out about the possibility of death from breast cancer at a young age. It's mentioned in a Netflix TV series, for crying out loud! Maybe, little by little, people are waking up to the reality that this disease is not a "good" cancer, not all pink and happy, not something to be trifled with or taken lightly. 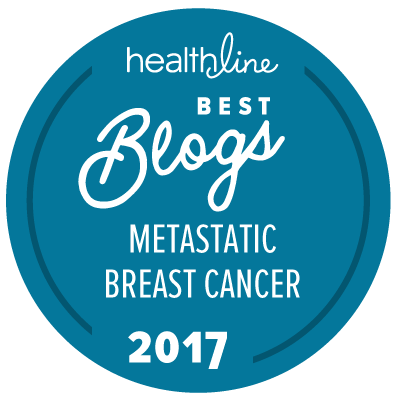 In that vein, I want to do my part to give some recognition to metastatic breast cancer. That's what this blog is about -- shedding some light. But this blog is not quite enough. So I wrote this piece, which was published here. Please take a peek. I don't know why I'm so nervous to share this here, but I think it relates to how weird I feel about self-promotion. But then, I think if I really want to be brave, I should tell my story to anyone who will listen. I should find as many outlets for it as possible and then do my best to make sure it reverberates. I hope you'll help me by sharing it far and wide. Shout it from the proverbial rooftops. Then I'd love to hear your story, too. Tell me how cancer affects you. As Sara Bareilles says, "I wanna see you be brave..."
Congratulations on your huff post. I've seen it making the rounds online with a really positive reception! Thank you! I'm happy to see it resonating with others. I SEE you BRAVE! thank you for the post you wrote; it was incredibly well done. people need to know the truth, and you did a fantastic job to tell it. Now I'm blushing. Thanks for the compliment, Karen! Incredibly proud. Can't connect to the post, but I will find it!!! Keep at it!!! I'm not sure why the link was giving you trouble, but glad you got a chance to read it! Let's get together outside the infusion center soon, okay?